The Radiant Warmer used to maintain the normal core temperature of the patients to prevent the patients from the hypothermia. 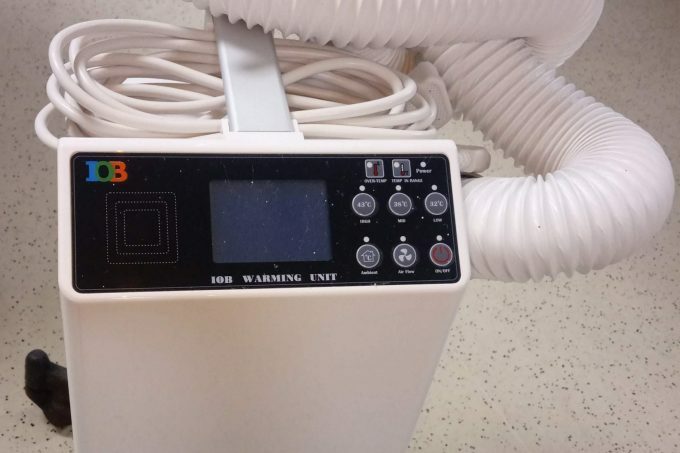 The warmer consist of the warming unit with the air supply pipe with/hose corrugated pipe with the sensor connected to the warming console. The warming blanket connected to the patient, which covers the whole parts of the body and connected to the warming device via air supply corrugated pipe/hose. To maintain the temperature for the patients undergone surgery or anesthesia. To prevent the hypothermia and maintain the body temperature of the patients. The temperature regulation helps the patients to stabilize with thermal comfort. The device helps in the prevention of hypothermia and reverse the decrease in core temperature. Do not apply in the Patients with a complaint of ischemic limbs. In the patients aortic cross-clamping, these devices contraindicated to apply on the lower extremities to prevent thermal injury. Use the Thermal regulation device in a safe and reliable way to enhance the outcome of the patients. Do not apply for the long duration of time without any monitoring of temperature. stop whenever patients temperature is normal in condition. Keep away the console from the acetone and ether solution. Connect the Device with the well-grounded receptacle. Switch on the on/off switch present at the lower part of the Device. Switch on the machine check with Green light is on or not. Testing alarm and calibration starts on the equipment, its take 30 seconds to perform of its own. Check with the air about the warm air or cold at the end of the connector. After checking to connect the hose port to the blanket and secure with the strap/tie given with the blanket. before application of the blanket apply the bedsheet over the patients to cover, to avoid thermal injury. Direct contact of the hose providing the warm is contraindicated. This may cause thermal burn or injury. Monitor the patients with core temperature. Warming console equipped with the air filter to control room pollution. Reduce the temperature setting according to the patients’ temperature. The alarm of over temperature start blinking and alarm activated automatically. Read the company recommended the manual for better understanding for calibration, continuity check, leakage test. Monitor the temperature every 15 minutes according to the protocol. monitor the patient’s vitals and record the temperature on the chart. remove the warming blanket from the patients. do not use the alcohol-based solution or solvents to clean. use only recommended the solution for the console. Monthly periodical checking and calibration must be done to avoid the damage or error in the machine. Change in the air filter, the sensor must be changed periodically. Any malfunction or error shows contact the service engineer, don’t try to open or repair of yourself. Read the manual in full before using the machine for better handling. keep in normal room temperature and humidity level to avoid bad performance of the machine. During surgery Body fluids and cellular fluids makes the low body temperature. The temperature in Operating room 18-21 ºC to reduce the infection from microbes, it is low when compared to normal temperature. To stabilize the normal core temperature warm fluids and radiant warmer is used. To correct and maintain the body temperature Radiant warmer used during surgery, after confirming the temperature of the body. In ICU the 18-21 ºC to be maintained. In pediatric patients, the temperature can be increased up to 24ºC.